Guffaw-inducing, with memorable characters and a touch of loving parody. Just one quick update -- the project funded, and looks to go well past basic funding, so if you're the "wait and see" type, go see. There is a pledge level that includes a character commission, and that character will also be included with the comic as one of their "paper minis". Two of the three stretch goals have been met. Right now the comic will include a hex map of the area it takes place in, and a bestiary of the "monsters" encountered by the protagonists. Last edited by Max_Killjoy; 2018-10-12 at 04:49 PM. I like this RPG a lot. I think it is a good fit for any action heavy campaign. Same here. I'm just trying to decide at what level to support it. Interesting note, the SW Kickstarter was fully funded 6 minutes after opening! Nice! I'll always have a soft spot for Savage Worlds. I've been meaning to get more familiar with Savage Worlds. Maybe this is a good chance to do it. My FFRP characters. Avatar by Ashen Lilies. Sigatars by Ashen Lilies, Gulaghar and Purple Eagle. I've never particularly liked SW, but I've respected it - this might be an opportunity to change that. At the very least I'm pretty sure Pinnacle will manage to bind their pages together competently this time. I would really like to see a game made by Obryn, Kurald Galain, and Knaight from these forums. Current Design Project: Legacy, a game of masters and apprentices for two players and a GM. I got their Flash Gordon books, which use the same format. Yeah it's pretty sturdy now. Believe it or not, they are switching to all hardbacks now (for major books going forward), in part, to increase durability of their product. I'm not surprised. My explorer's edition book fell apart during the first reading, and I baby my books to the point where it is literally the only one I've had any issue with in any system. I suspect mine was unusually bad (moisture changes in shipping or whatever), but I'm far from the only person who had problems with that printing. Maybe they should use the stitching used in the AD&D 1st edition first printing of the Player's Handbook. That thing is indestructible. Last edited by Particle_Man; 2018-10-18 at 05:56 PM. Light the lamp not the rat LIGHT THE LAMP NOT THE RAT!!! My Flash Gordon hard-backs are well stitched and they are apparently so impressed with the durability that they are dropping soft-back support for the core rulebook. Just over 48 hours to go at this point. All three stretch goals were met, so anyone who pledges now will get the entire package guaranteed, no waiting to see what level they reach. This will be my last update on this one, I don't want to go into total spam mode. Thank you for the notification. Backed. I have an acquaintance who is a fan of Savage Worlds and I sat in on one session. I liked what I saw of the game. The crowdfunding campaign for SOW: Seeds of Wars is now live on Kickstarter! It will be available for 35 days. Join us now and pick the reward that suits you best. The first 100 backers get a discount on the hardcover version of the corebook! Also have a look at our list of social media achievements. By helping us SOW the seeds of wars, you can unlock some additional cool features. "Think of it as a great, big can full of sky... You could drop Mars into that can, and then tuck Luna and Europa in on top." "I have standing orders to start exactly zero wars." Five days to go at this point. Many stretch goals already met. BUT, they're about $2300 from a retrospective sketchbook of Howard's work, and about $17250 from an "R&D" goal that would make an actual Howard Taylor novel about some old favorite characters their next project. When it comes to map-making software and mapping assets for pen-and-paper RPGs, the sci-fi genre usually gets short shrift. GMs of sci-fi RPGs like Starfinder, Star Wars RPG, Traveller, Shadowrun, Stars without Number, and other game systems need and deserve a good set of tools and assets to create great looking battlemaps, whether printed for use at the gaming table, or for use in virtual tabletop software like Roll20 or Fantasy Grounds. I'm running a Kickstarter campaign to try to provide a solution. I hope some of you will check it out. Note that this new content would be in addition to the 10 sci-fi content Add-Ons that already exist for MapForge. PS: The 1st Update to this campaign has information about an 11th free content Add-On that will be released to backers once the campaign funds. MapForge is easy-to-use battlemap creation software for Windows and Mac OS X. Last 3 days of the MapForge sci-fi campaign. Only a few more backers needed to fund this! There's an additional content preview videos posted here and here. Last edited by heruca; 2018-11-27 at 08:26 AM. Oh, and uh. The new stretch goal for Blades in the Dark is an official Vlad Taltos hack, with Steven Brust writing an Adrilankha city Guide. •	PDF & Hardcover: 2 versions, Full Colour + B&W Line Art. •	9 Classes: Artificer, Barbarian, Bard, Cultist, Fighter, Monk, Ranger, Rogue & Magic User; only two of which involve magic. •	12th Level Max eliminates the most powerful spells, and keeps the mightiest monsters scary. •	Unique Features: every 3rd level design your own PC ability in conjunction with your GM. Don't want to make your own? Choose from 36 examples instead. •	Roll Equal or Under for attribute checks (inc degrees of success), making every stat point matter. •	Skills provide access to a level based Reroll Pool, smoothing the fickleness of d20 probability distribution. •	Willpower & Perception attributes replace Wisdom. •	Luck attribute replaces saving throws and powers some Martial Exploits. •	Minor, Major & Rescue Exploits on top of damage, not in lieu, promote improvised stunts and moments of greatness. •	Dangerous Combat: Dropping to zero hp requires a roll on the Injuries & Setbacks table and healing is delayed by 1d3 minutes (magical or otherwise). Players don't roll to find out if their PC is All Dead or Mostly Dead until the battle ends and someone checks the body. •	Party Retreat & Chase rules allow the GM to throw whatever makes sense at the party, unshackling them from balanced encounters and quarantined zones. •	5 minute Short Rests allow PCs to attempt Willpower checks to recover hit points and class abilities, encouraging the party to push on rather than camp. •	Long Rests take 1d6 days (or 1d4 in a safe, comfortable environment), mitigating the nova, rest, repeat problem for adventures with long periods between battles (eg: wilderness treks). •	Dark & Dangerous Magic tests and Divine Rebuke tests make all spell casting inherently uncertain. No at-will, teleport, mind reading or resurrection magic. Magic Users are less reliant on spells, proficient in one handed weapons and light armour. •	Evocative Spells: Spells have been tweaked and renamed, eg: Silent Image, Invisibility, Magic Missile and Hold Monster are instead Shadows & Dust, A Wisp Unseen, Lash of Unerring Pain and Crush of the Warp. •	Rare Magic Items, with obvious and discreet attunements, that unlock as their owners level up. •	GM Tables for Weather, Exploration Events, Random Encounters, Traps, Treasure, Disease, Madness, Tavern Brawls, Hirelings, Mass Battle, Naval Combat, NPC Quirks, Rival Adventurers, Blackpowder, and more. •	130+ Monsters including effective Boss Monster options (eg: Off Turn Attacks match the party's action economy, and Stronger Luck grants saves even when a save is not normally permitted), plus custom monsters guide. •	Online Play Support: an LFG character sheet is available for online play via Roll20. •	Open Game Content: 99% of LFG text is "Open Game Content" under the Open Game Licence. Want to make your own adventures or expansions for LFG and sell them (including using expressions such as “Compatible with Low Fantasy Gaming”)? Go right ahead! Last edited by Psikerlord; 2018-12-03 at 06:12 PM. Low Fantasy Gaming - Deluxe Edition - Kickstarter is now LIVE! I know there's a few lovers of ADOM here, so I'm super happy to announce that the kickstarter campaign for ADOM the Roleplaying game is now live! Based on the groundbreaking genre defining roguelike computer game, ADOM the Roleplaying game will allow you to adventure with your friends in the Ancient Domains of Mystery. Ancardia was a peaceful world, but a mysterious Gate has opened in a deep and long forgotten cave and now the forces of Chaos spread their corrupting taint, twisting and changing the very essence of beings. It is for the heroes to decide which side to choose, if any, for Chaos offers tempting powers far beyond mortal capabilities. 12 races and 22 classes allow for a wide variety of unique playstyles where both class and race decisions will continue to matter as the characters grow in power. ADOM the Roleplaying game is part of the Old School Revival movement and fully compatible with other OSR titles, featuring the "Danger System" - a smart take on advantage/disadvantage mechanics designed to simulate complex situations with very few rolls. Featuring over 600 full colored pages with gorgeous, handpicked artwork over two books, ADOM the Roleplaying game seeks to set new standards in indie RPG design. If you want to learn more and see some spectacular samples, check us out at www.adom-rpg.com. Please note that this is the Kickstarter for the pen & paper roleplaying game. The Kickstarter campaign for Ultimate ADOM (www.ultimate-adom.com), the sequel to ADOM the computer game, will launch at the end of February. And if you have any questions, feel free to PM me! Mutant Donkey is offering digital graphics for roleplaying games. Please visit our Patreon for an introduction video. I am a real life registered architect so building graphics will have a higher level of fidelity. -Buildings with option for custom projects including 3d digital models, floor plans, sections, site plans, elevations. There is an option to generate 3d files for 3d printing purposes. -Drawings come with grids for roleplaying. They can also be plain pending on your needs. Fully rendered in color or black and white, again, per your needs. -We are starting a brand new podcast for the Patreon as well. Note: Mutant Donkey does not provide architectural services, I have a separate business for that. This is my passion project. Thank you for taking the time to look at this and please let me know if I can be of assistance with your gaming needs. Magignosis is a source book for 3.X that includes four new classes designed to be quick and easy to build while still having lots of cool powers. I developed the classes because Pathfinder NPCs took way the Hell too long to create in large numbers. If you're a GM who uses class-leveled enemies regularly, these classes can save you a lot of time while keeping your villains interesting and level-appropriate in a fight. Alternatively, if you're a player and you enjoy getting awesome new powers more so than getting a half-dozen tiny bonuses that synergize into an awesome combo, these classes also do that. In addition to the classes, the book contains new spells, new feats, new NPCs built using the new classes, some fluff mainly revolving around the Order of the Third Eye from my adventure Petals and Thorns: Strangers in Ramshorn (successfully Kickstarted last year), as well as new fluff based on iconic characters submitted by backers. If you're the sort who likes leaving a mark on Kickstarted settings, the limitations on what an iconic character from a sourcebook can be are significantly more relaxed as compared to an adventure, because a sourcebook doesn't have its spotlight reserved for the main plot and party, so now's your chance to include whatever in my setting instead of being limited to NPCs appropriate to the level, location, and premise of a specific adventure. As some of you might have noticed, I'm a big fan of Thieves Can't, a webcomic about RPGs and player quirks, kinda seen through the eyes of the characters. See, the links to the Kickstarter campaigns I've linked in this thread. Well, as a side note, in addition to the Kickstarter campaigns, Bart and Zach have an ongoing Patreon. Hi everyone, we're pleased to announce our very first Kickstarter! Professor Humbert Drumsley: 5e Adventure Codex is a collection of short adventures compatible with the latest edition of the world's oldest fantasy roleplaying system. These adventures ideal for low level characters, and they're designed to be fun, fast-paced, and light-hearted. The finished Codex will be approximately 80+ pages in a 5.5 by 8.5 inch format. It will contain 10 short adventures, a character write up, statblocks, magic items, and more! The Codex is fully written and has seen a first round of editing. Illustrations have also been secured, using some top-notch artists from both in and outside the industry. Professor Humbert Drumsley is an aging wizard who is confined largely to his tower and estate. He dresses in the traditional garb of the magically inclined, favouring long flowing robes that match his long flowing beard. He is often seen wearing a pointy hat, which is purple and adorned with silver stars. While other wizards may scoff at his choice of attire, Humbert revels in it, feeling that it gives him an air of classic representation. Humbert was once considered a wise scholar, but years of arcane invocations have left somewhat of a mark on his mind. After a magical incident, Humbert has been suspended from his chair at the local magical university ("But I'm still a professor, dammit!"). Humbert's peers agree that his incompetence makes him an embarrassment, but he is so oblivious that many consider him blameless. If you want a taste of what the finished codex has in store, check out our free adventure Oh, I Hate Spiders! 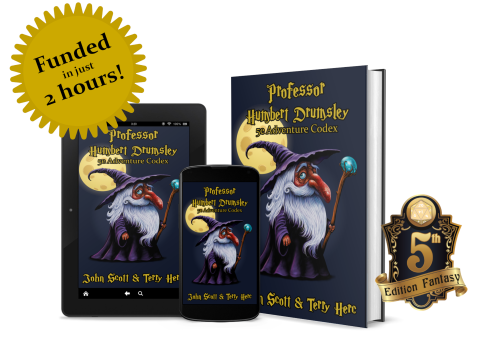 Professor Humbert Drumsley: 5e Adventure Codex is accepting pledges on Kickstarter through March 1st. Click here to access the campaign page. Just want to share this Kickstarter project that is currently in my sights and a favorite. I am a Libra so the Libra dice isn't ideal for me since it is pink, but I love them all. My favorite is probably Scorpio, so I'm going for the Complete Set. Help unlock out 10th stretch goal by sharing this Facebook post! At 20 shares we add 20 of Humbert's former classmates. Not all of them turned evil! Plus we've got lots more stretch goals in the works. At $5,500 we will add 3 of Humbert's foes (NPC writeups and statblocks). And at 300 backers we will add 12 more statblocks! Check out the campaign today! The spells are written in general OSR format, but can easily be converted to other systems. Please visit Kickstarter and search for "Other Magic" (the forum software won't let me post links here). There's just a little bit over 24 hours left to back ADOM the Roleplaying Game, our pen&paper conversion of the famous rogue-like. Funded within 24 hours, we unlocked several stretch goals so far and announced a couple of lovely things, like revealing our list of our guest authors, featuring Ed Greenwood, Skip Williams, James M Ward and several other legends of the RPG world. Some of the KS page description of the system sounds interesting. Can you tell me more about the system itself? What kind of system is it, what's the basic resolution mechanic, is it levels and classes, or point buy, or something between? E: nevermind, it's over already... I had it saved to check back on it, I wonder why I never got my reminder from Kickstarter. Last edited by Max_Killjoy; 2019-02-14 at 05:26 PM.